A deeper look at the grooves pressed into the Live and Loud!! LP by Lars Frederiksen and the Bastards. In this digital age of perfectly pressed, equalized and mastered music, something truly seems to have been lost – particularly from live albums. These days, live albums just seem too contained; because those making the recordings often know exactly how to make and produce one, a lot of the of-its-moment energy which comes together at a concert gets forgotten and, because repairing mistakes and imperfections in post-production is easier now (with the help of digital tools) than it has ever been, the results sound good but don’t actually sound live. Records like that feel more like a sitcom complete with canned laughter added; it’s good but also very, very safe. The cool thing about Live and Loud! 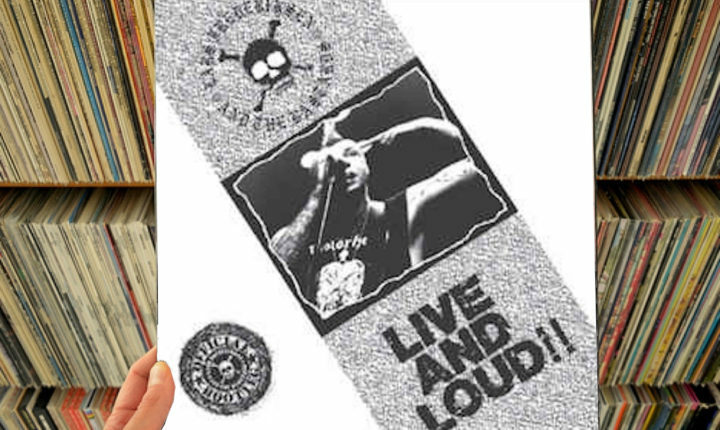 !, the first live release from Lars Frederiksen and the Bastards, is that it goes back to the tape trading days of live recordings and presents the band warts and all without a safety net – thereby showing how good the Bastards really are when they step onstage. Captured during the tour to promote Lars and the Bastards’ self-titled debut album, the live wire energy and excitement of the moment is both awesome and immediate. As soon as “Dead American” kicks the doors open to start the album’s A-side, listeners will be pulled right in with incredible force; Lars has to fight to be heard over his own guitar amplifier as well as that of Jason Woods’ bass and Scott Abels’ drums, so the energy has to be up high or else everything would just be overcome and the mix would disintegrate. Such a description might not sound like the most glowing endorsement, but it works; it forces listeners to (figuratively) fight their way to the lip of the stage and strain to hear everything that’s coming through from the band clearly. ?Live and Loud!! is out now. Buy it here, directly from Pirates Press.